My love of the bush began with a trip to Zimbabwe when I was young. This was followed by many other wonderful African adventures with my family and friends throughout my life. When I finished studying Photography and Graphic Design I moved to our family farm in Stellenbosch to help my Dad make our wine, Heron Ridge. This passion very quickly became the start of my life as winemaker and farmer. However, after nine years of wine making the pull of the bush and desire to protect it was too much to ignore. In 2013 I did FGASA level 1 course with EcoTraining in Selati and the Makuleke concession. I was hooked. 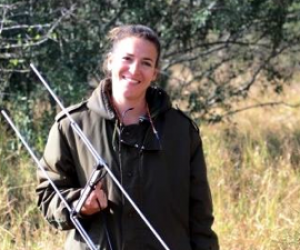 Six months later I moved to Zululand and joined the Wildlife ACT team. It is a privilege to be part of this team and an honour to be helping conserve our endangered species. I am particularly lucky to be a part of a rather large pack of African Wild Dogs.